Nordic Semiconductor had announced that Taiwan-based gesture control solutions developer, H.P.B Hi-Tech Corp has selected Nordic’s nRF51822 Bluetooth low energy (Bluetooth LE) system-on-chip (SoC) to provide the wireless connectivity for its HPB Wave1S, a hand gesture recognition device that enables hands-free audio playback, volume adjustment control, and smartphone operation. To get started, the device is paired to the user’s Bluetooth 4.0 (and later) Android smartphone running the HPB Wave app. 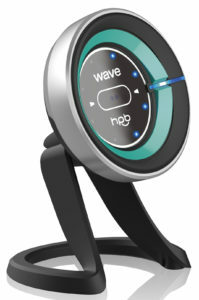 Once paired, the user can control certain smartphone functionality via the HPB Wave1S using a range of hand gesture profiles. For example, in “cellphone mode”, waving a hand up in front of the device will answer an incoming call, or waving down will hang up or reject the call. In “music mode”, waving up will begin or pause audio playback, while a clockwise or anticlockwise rotation of the finger will either increase or decrease volume. Waving right will skip to the next song, while waving left will play the previous selection. The device integrates an array image sensor and a low power infrared LED to capture the user’s hand gestures, which are in turn relayed to the user’s smartphone using low latency Bluetooth LE.